With development pressure on the rise in recent years throughout Northern Virginia, the Land Trust of Virginia felt the need to be more strategic and proactive in protection of the Blue Ridge Mountains. We all appreciate these mountains for the scenic views they create, but this ancient mountain chain also provides critical habitat and corridors for wildlife and a variety of ecosystem services such as erosion prevention, filtration of pollutants from water, absorption of carbon from the atmosphere, and many others. 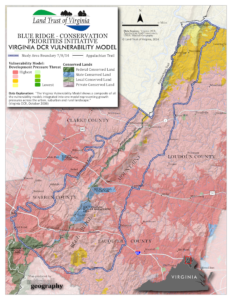 In 2013, LTV began the Blue Ridge Conservation Initiative, a mapping and analysis project that focused on a 40-mile stretch of the Blue Ridge from the northern end of Shenandoah National Park to the Potomac River at Harpers Ferry. 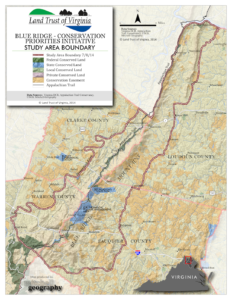 In total, the study area was comprised of more than 200,000 acres in Loudoun, Fauquier, Warren, and Clarke County. Out of the 200,000 acres, only about 30,000 (15%) are currently protected by state or national parks, or conservation easements. This represents the largest expanse of unprotected land flanking the Blue Ridge Mountains in its entire 600-mile length. With support from a grant from the Virginia Environmental Endowment in 2014, LTV worked with an expert cartographer, Paul Mitchell, to complete the first phase of the project- the mapping. In addition to the baseline map identifying the study area, LTV produced 21 maps of the occurrence of natural resources and conservation values as they exist on the parcels within the study area. Examples of these mapped conservation values include species richness of amphibians, birds, reptiles and mammals, historic/archaeological resources, National Wetland Inventory, Prime Farmlands (as designated by the Virginia NRCS), Appalachian Trail viewshed, adjacency to protected land, and many others. After mapping each variable independently, composite maps were created to show all 21 variables and the parcel conservation priority rank of the individual parcels within the study area. This led to the identification of 286 parcels, totaling over 41,000 acres, which are the highest priority for future protection in the Blue Ridge Mountains. With the data and maps in hand, LTV began the second phase of the project- the presentation of the information to the public. The information found in the study has been presented to 12 conservation organizations, as well as in three outreach meetings with the public, attended by interested landowners within the study area. In early 2018, LTV was awarded a second grant from Virginia Environmental Endowment to advance the Blue Ridge Study and hired a new staff member, Seth Young, to direct the project. The third and final phase of the Blue Ridge Conservation Initiative is direct outreach to landowners identified in the study and permanent protection of parcels in the study area through conservation easements. 2nd Annual Tour de Conservation Easement Bike Tour September 29th | 8am | Upperville - Click here for more info!